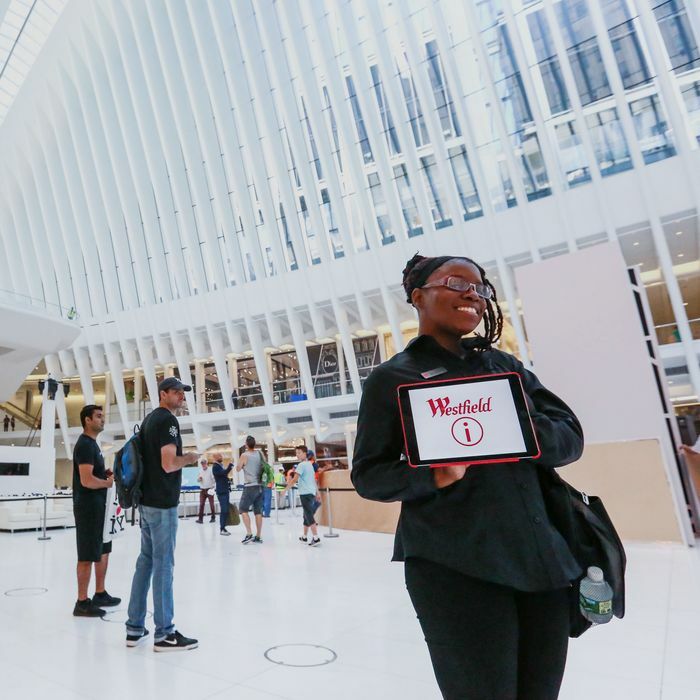 The World Trade Center’s $4 billion sun-lit transportation hub (or boondoggle, depending on whom you ask) is making its play to become Lower Manhattan’s shopping mecca as the new Westfield World Trade Center Mall opens Tuesday, almost 15 years after 9/11. A ceremony and other festivities are welcoming shoppers to the 365,000-square-foot shopping center on its grand-opening day. This included a performance by Hamilton’s recently departed Leslie Odom Jr.
About 60 stores are in business now, which includes a bunch of other high-end retailers. There’s an Eataly, which opened last week. Even more popular: the Apple store. More than 100 stores will be open in time to serve commuters doing their Christmas shopping on the way home from work on December 24. As reporters who previewed the mall Monday noted, the sounds of construction are still echoing throughout the Oculus’s cavernous space. The Port Authority still owns the actual site, but Westfield Corporation — which also owned the original mall that was destroyed in the 9/11 attacks — runs all the retail business. The company expects close to $1 billion in sales annually from this location.